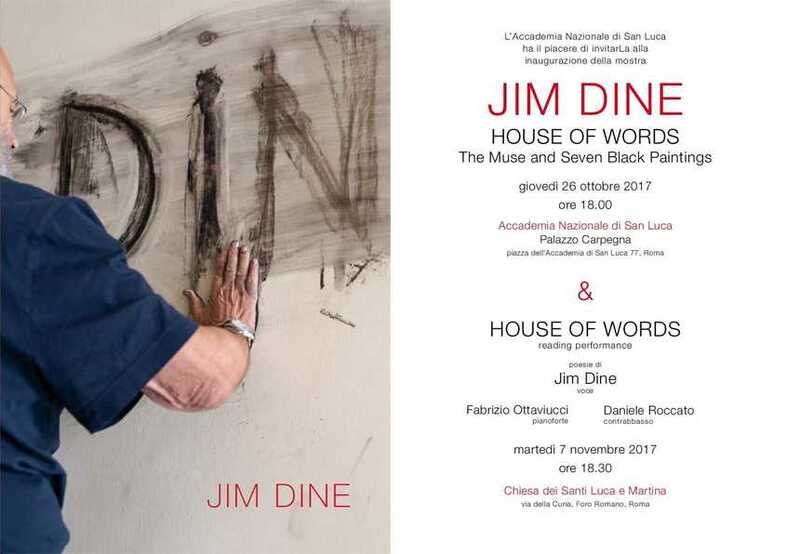 From 27 October 2017 to 3 February 2018 the Accademia Nazionale di San Luca will present the exhibition entitled "JIM DINE. HOUSE OF WORDS. The muse and seven black paintings" at the exhibition halls of Palazzo Carpegna's historical site, near the Fontana di Trevi in Rome. The exhibition will celebrate the entrance into the Accademia Nazionale di San Luca of Jim Dine, in the foreign academics category, representing the mutual tribute that the artist and the institution exchange. For the exhibit a bilingual catalogue (Italian/English) will be published with texts written by Paola Bonani, Gianni Dessi, Lorand Hegyi, Vincent Katz, Francesco Moschini, Claudio Zambianchi and with a text that appeared in the magazine Marcatre in 1965 where Alberto Boatto, who recently passed away, sketched a vivid portrait of the artist.